The internet is a great place for English language teachers, if you know to where to look! Here are my top ten resources (ok I cheated a bit by grouping some!) – have you used them all yet? Conversely: What is your favourite resource? – Have you used any resources that completely wowed you, that aren’t on this list? Please comment and let me/everybody else know about them! The British Council Teaching English website and Facebook page are both very valuable resources for teachers with any level of experience. articles on methodology, skills etc. 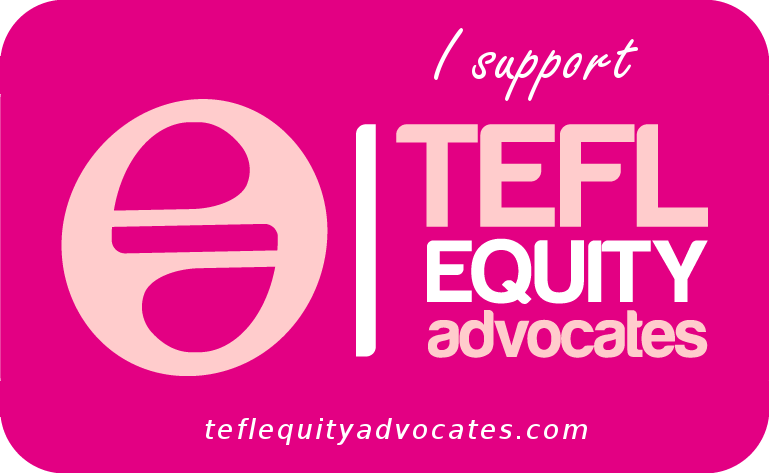 The Facebook page is where links are shared and people can be found discussing the ELT-related issues that those who run the page raise for this purpose on a regular basis. Both are well worth a visit! – and the ease with which it is possible to find things due to clear categorisation. In addition to resources, they also have a handy jobs section. Some of the resources are freely available, while some are only available if you subscribe. Academia.edu might seem less user-friendly than the above two websites, but is nevertheless a very valuable resource: as a researcher, you can register and upload .pdfs of articles that you have written, to share with the community, and as a teacher/reader, it gives you access to research for free, which is not something to be sniffed at! You have most probably read, or at least heard of, the ETp magazine for teachers, which contains articles and activity ideas, book reviews and much more. Well, the ETp website is equally worthwhile and demonstrates commitment to professional development in the resources it provides to this end. Each of the different sections contain links to articles around various topics and the site also has its very own registered blogger, Chia Suan Chong, whose posts are always worth reading. Currently, EtP are also organising a one-day conference, which will be held on 21st June 2014 in Brighton. 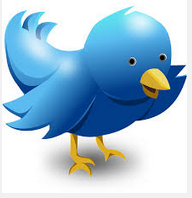 The ubiquitous Twitter bird via Google search for images licensed for commercial use with modification. Naturally! By Twitter, I don’t mean the Twitter website, per se. What I mean is the wealth of links it can make available to you and the discussions you could participate in, if you use it professionally. As everything you need to know is in the afore-mentioned link, I’ll leave Twitter right here. Sandy Millin’s blog: Sandy is a DoS at IH Sevastopol and has been blogging for a number of years now. Her blog contains a wealth of teaching ideas that she has tried and tested, reflections, collations of useful links, for example relating to the Delta qualification that she recently completed and to Cambridge exams like FCE. 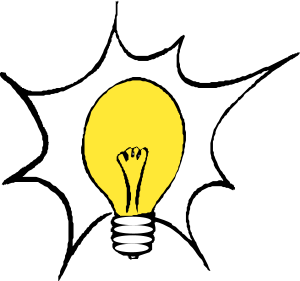 You might also like to check out her (Almost) infinite ELT ideas blog too, if you require an injection of fresh inspiration! In this blog, which is all about collaboration, she publishes a potential resource and canvasses ideas for how to use it with students. Now that she has finished Delta and is settled in her post-Delta new job, this site has been resurrected so keep checking back. Adam Simpson’s blog:Adam works at a Turkish university and is dedicated to his students and to his own professional development, as well as sharing these passions with others. His blog contains a wealth of interesting posts related to this. Rachael Roberts’s blog: Rachael Roberts is a teacher, MaW SIG committee member and materials writer, and her blog contains lots of useful teaching resources and materials that she has developed, together with the rationales behind them, and tips for creating your own materials too. Some of these blogs sport a “blog roll” of other blogs that the owner has found interesting and useful, so it would be worth checking these out too. Of course there are hundreds more I’d love to name, but this post would get awfully long if I did so! Demand High ELT is a growing site, owned by Jim and Adrian, and devoted to Demand High ELT. There is discussion, links to relevant resources, materials for seminars and more. An A-Z of ELT is Scott Thornbury’s blog, containing a wealth of articles about a range of ELT-related topics and issues. Adrian’s Pron Chart Blog is a very useful stop if you are a chart fan and looking for ways of using it with your students. Hugh Dellar’s Blog is full of interesting discussion about various ELT-related topics and ideas that you could try out in your own classes, as well as recordings of talks he’s given at past events. Of course, the kind of blogs you read will depend also on your own interests within the profession. 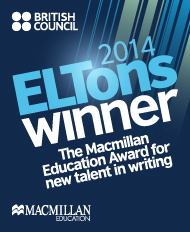 To see links to blogs which relate to ELT management, please click here. To see links to blogs which relate to Delta please click here. Why not start blogging yourself, too, if you don’t already? There are lots of good reasons to do so! Free Webinars for Teachers is a Facebook group where people share information about free webinars that teachers can attend. This makes it a good way of keeping up with what is available in this area of online professional development. You need to make a request to join and posts are moderated so that content remains useful to members. You can choose whether or not to receive notifications when something new is posted. Nik Peachey’s Learning Technology blog which is updated regularly, and contains lots of discussion regarding the latest technological innovations that Nik has come across. Russell Stannard’s Teacher Training Videos site : if there is a technological tool that you want to use but you don’t know how, there is probably a video that can help you on this site! The Consultants-E – a screen shot. The Consultants-E : These guys offer training courses and consultancy services but also carry some freely available great resources relating to technology on their website. You can find these by clicking on “Resources” on their home page. 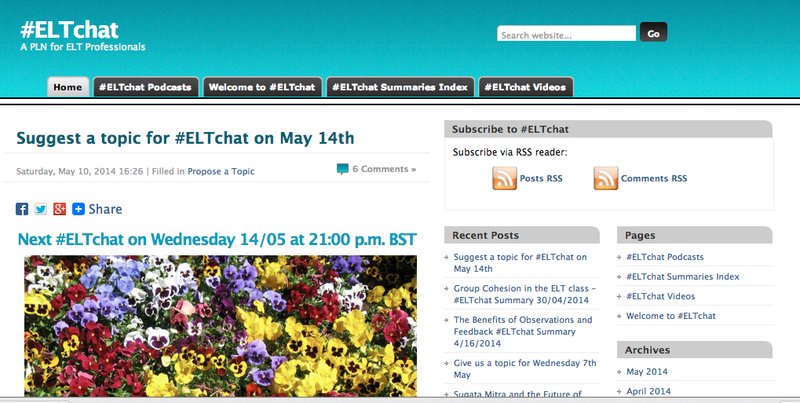 You could argue that this is part of Twitter, but these days #ELTchat exists beyond the bounds of Twitter too. There is the website, where you can find all the summaries carefully indexed by date, as well as links to podcasts and videos. 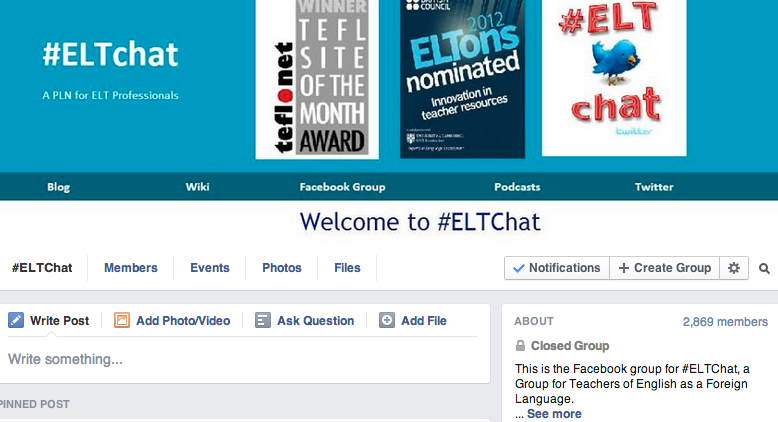 ELTchat – a PLN in the making: a screen shot. And there is also the Facebook group, where people share links to interesting sites they’ve found, to recent chat summaries and more. …and the Facebook group page – a screen shot. IATEFL is the International Association for Teachers of English as a Foreign Language. This organisation has a website , a Facebook group page , and lots of satellite pages run by various of the SIGs or Special Interest Groups. The website contains information about forthcoming events, links to webinars that the association has put on (as well as information about those forthcoming), information about the afore-mentioned SIGS and of course its jobs pages where you can see job advertisements, especially in the run up to the annual IATEFL conference, due to the job market place that runs during this event. 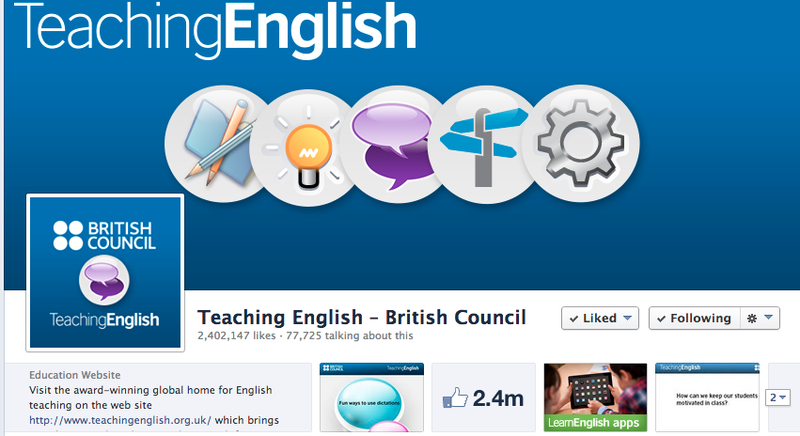 The Facebook page is a space to discuss ELT-related issues and share links of interest to others in the profession. It is not a place for self-promotion and advertising (or spamming!). MaW SIG Facebook page : For materials writing fans – here you can find information about events run by MaW SIG, links to materials writing-related blog posts and sites, information about other materials writing-related events and connect with people who are also interested in materials writing. BeSIG Facebook group : For those with an interest in Business English teaching. TD-SIG Facebook page: for those with an interest in teacher development. 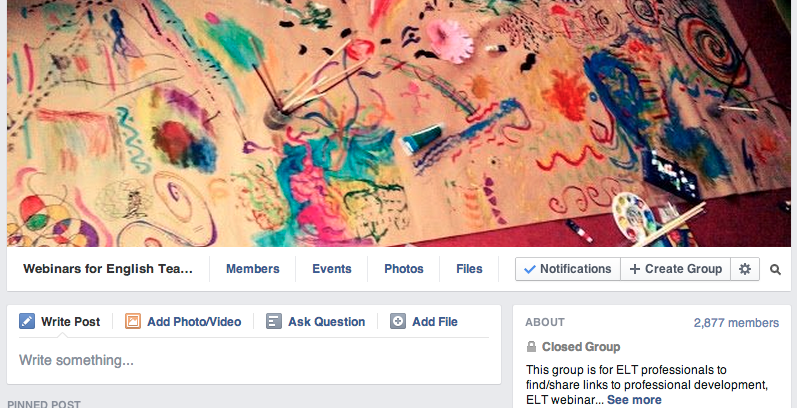 Young Learners SIG Facebook group : For those with an interest in teaching young learners. Here is a list of all the SIGs currently in action, so if you find one in your area of interest, google it and you will doubtless find a Facebook page and/or a website that it maintains. You could also email the coordinator (name and contact details given in the list) for more information. SIGs are a great way to connect with like-minded individuals and keep up with issues in your professional area of special interest. 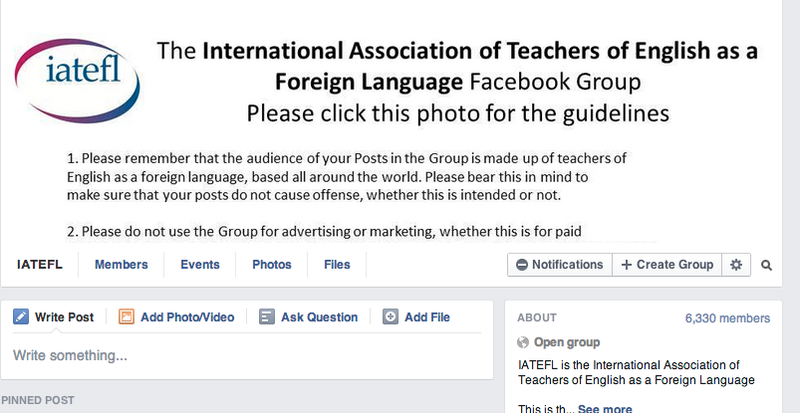 You have to pay to join IATEFL, as well as any of the SIGs themselves (which is highly recommended, as you get plenty of membership benefits), but following their Facebook pages and Twitter handles is open to all. Don’t forget: share your favourite resources too, by commenting on this post! – image taken from openclipart.org via Google search licensed for commercial reuse with modification. This entry was posted in Classroom Talk, ELT Top 10's, Professional Development and tagged #ELTchat, blogging, edtech, ELT research, IATEFL, onestopenglish, professional development, teacher blogs, teachingenglish.org, technology, Twitter. Bookmark the permalink. Thanks for posting this. Very useful. These resources are useful. I have already started using them. Glad it’s useful! 🙂 Lizzie. I am a language teacher in Ghana .Resources language teachers difficult to come by,I would most appreciated if these resources are made available to language teachers globally.These resources should be develop to meet the various levels of education.Thank you. This is a great list! Thanks so much for taking the time to put all this together. Very useful for those of us doing CELTA! Thank you, Lizzie. Another great reference post! Great list, Lizzie, good to find them all in one place – didn’t know about elt-resourceful so I’ll take a look – if you make a list of the next 10 you might like to look at #eltpics! Thanks a bunch. Very useful. 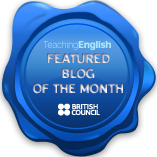 You could also take a look at EFLSmartblog which is by David Mainwood. 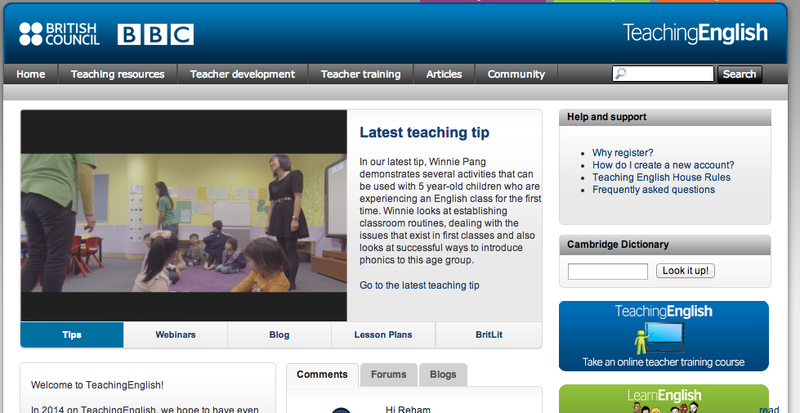 An excellent blog for teachers. Bryan.